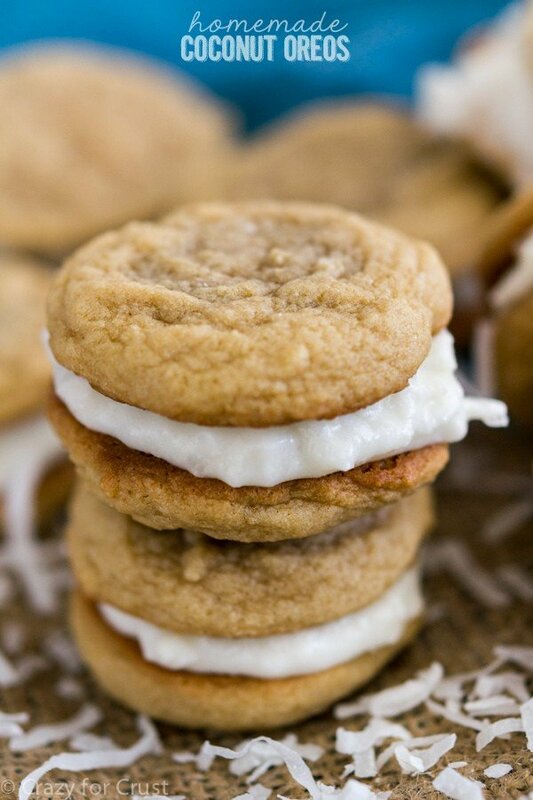 Coconut Oreos – I certainly have an obsession with homemade Oreos. Especially when they’re golden. This time I made a version that not even Oreo makes: Homemade Coconut Oreos! Spring break is fiiiiiinally over. They get a week AND the day after Easter, which is totally overkill. Even though last week was a breeze since we were in San Diego, we got home and Jordan was instantly bored. “What should I dooooooooo Mommy?????!!! !” she wailed. “Well, since I just spent 5 days sleeping in hotels and family’s guest rooms, schlepping to the beach and the zoo, eating from amazing donut shops, visiting a mission, and then I’m paying who knows how much to FedEx the stuffed animal you left in the sofa bed, maybe you should just go read a book,” I replied in my head. Instead, I made her cookies. Because the Easter candy wasn’t enough. I have quite the obsession with homemade and copycat recipes. Sure, buying cookies are great. Making them at home? Even better. Because no matter how much I love Golden Oreos, my recipe doesn’t include thiamine mononitrate which supposedly is a vitamin but sounds weird. My cookies have ingredients you recognize. Like COCONUT! 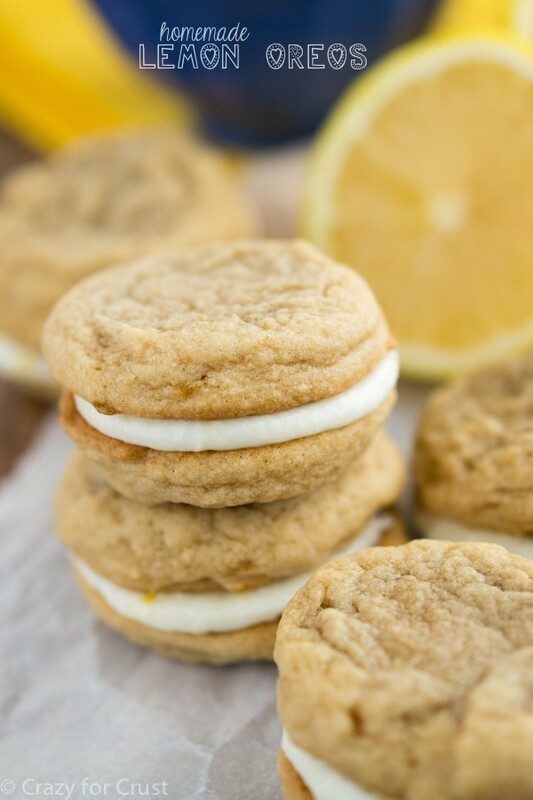 When I was making the Lemon Oreos last month I had a vision: Coconut Oreos! As far as I know, Oreo has never made a coconut version, but I might be wrong. Regardless, I made a homemade version and I’m so glad I did. Because, coconut. I didn’t chill my dough, which means you get cookies in your belly faster. For some coconut flavor in the cookie recipe, add 1 teaspoon coconut extract. I used regular milk in my filling but if you have coconut milk, use that. It’ll make the filling even better! Watch how much milk you add to the filling. I added a little too much which meant that I had to keep these chilled. Not a bad thing, they’re yummy cold, but don’t be a heavy handed milk pourer! 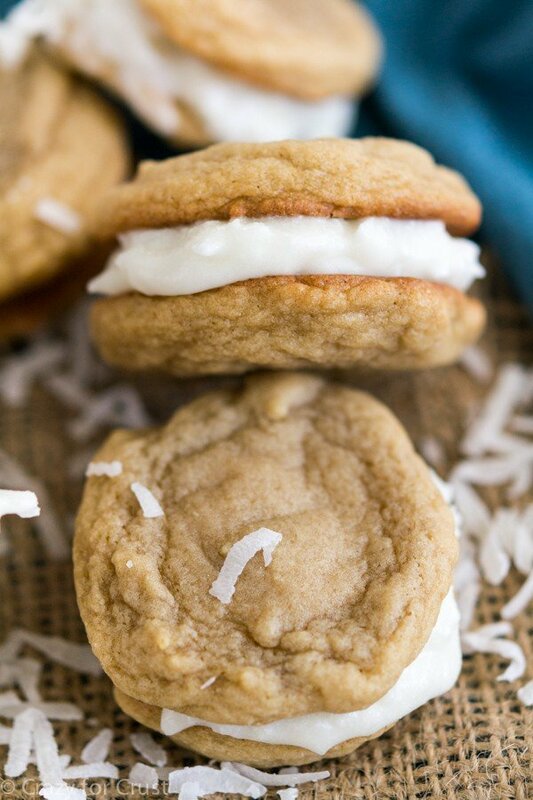 Sweet vanilla cookies sandwiched with coconut cream filling! Like a Golden Oreo only better. Preheat oven to 350°F. Line cookie sheets with parchment or silicone baking mats. Whisk baking soda, salt, and flour in a medium bowl. Set aside. Cream butter and sugars in the bowl of a stand mixer fitted with the paddle attachment (or using a hand mixer). Cream until fluffy, about 1 minute. Add egg and vanilla and mix until combined. Slowly mix in dry ingredients, scraping the sides of the bowl as necessary. Scoop 1 tablespoon cookie balls onto the cookie sheets, 2” apart. Bake for 7-8 minutes, until the edges are golden. Remove from the oven and tap the cookie sheets on the top of the stove lightly to flatten the cookies a bit. Let cool completely before frosting. To make the frosting: mix butter with a hand mixer until creamy and smooth. Mix in powdered sugar slowly until crumbly. Add coconut extract and 1 tablespoon milk and mix until smooth. Add up to 1 more tablespoon of milk to get the right spreading consistency for your frosting, but only add 1 teaspoon or less at a time so you don't make it too runny. Stir in coconut. 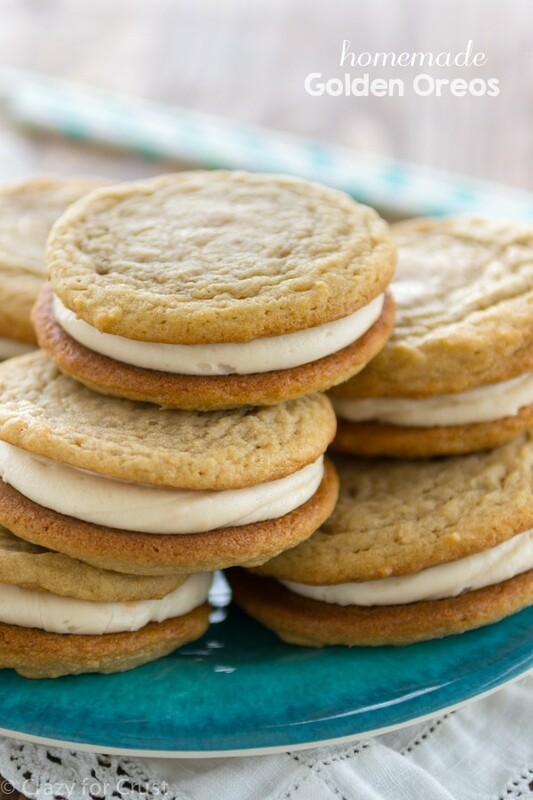 Frost the bottoms of half the cookies, then sandwich with another cookie. Store in an airtight container for up to 4 days. YES! Everything about this is so perfect! I love oreos but NEVER buy them. Honestly I can’t remember the last time I had an actual oreo because I hate the ingredients they use. 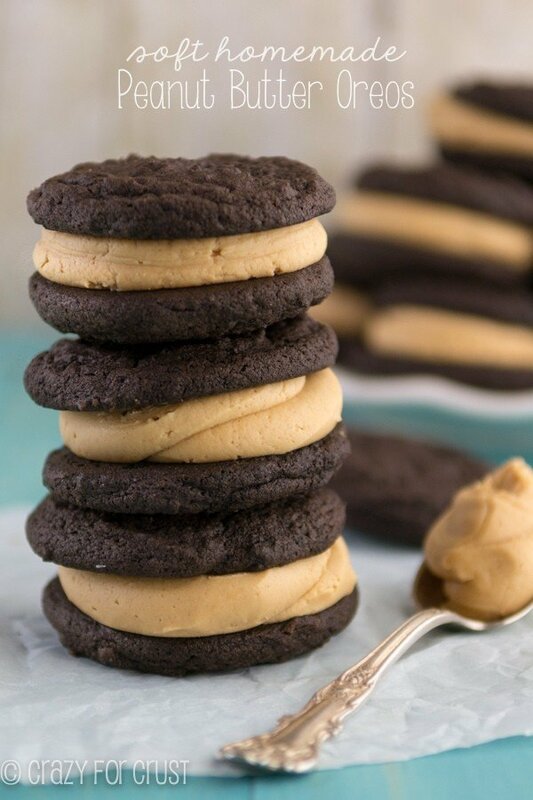 Homemade oreos though? THAT is something I’m on board with. These are perfect and I love the coconut flavor! Oh my goodness, I’m dying here. I love coconut so much and I’m so jealous of your trip to San Diego and those donuts. Donuts are my FAVE! Anyway, I must try these asap! So, in the cookie part of the recipe it calls for brown sugar twice. Is this a typo, or am I supposed to use two different types of brown sugar? Thank you for catching that Tasha! The second one should be granulated (but even if brown was used it would be okay!) It’s all fixed now. I’ve never had those – they sound amazing!